Our friends, Taylor and Julia, are expecting their second baby girl. We have been friends with them since college and now they live only 6 hours away from us. To celebrate baby #2, I designed and made a applique onesie just for them. In college, Taylor fashioned retro shirts with fun sayings such as “Passion Patrol” or “Let’s Get Physical” or “Gettin’ Lucky in Kentucky”. 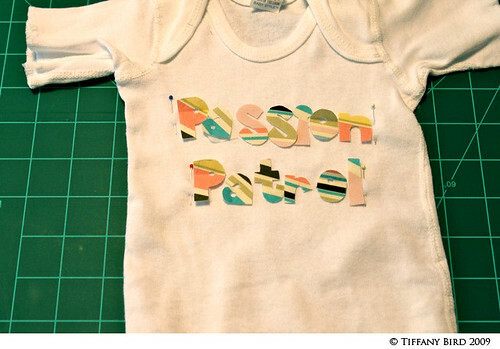 Then the thought came to me, How fun would it be to put “Passion Patrol” on an onsie?! 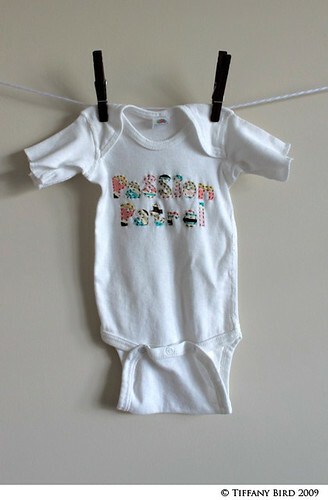 So here I go with my first tutorial: applique Passion Patrol onesie. If you make something using this tutorial, please upload pictures of it in our Flickr group to show it off to everyone. You may be featured on Simply Modern Mom. 1. 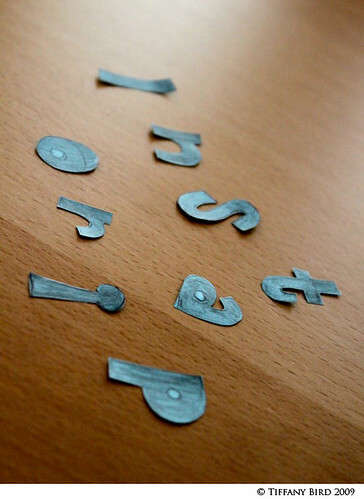 I designed my own letters on paper then cut it out. 2. I used Lite Steam-A-Seam2 trans-web sheets, they are amazing and so simple to use. I used the lite weight trans web for the onesie so the letters won’t be too stiff. The Steam-A-Seam2 is easy to use because you only iron once and you can readjust the applique until you iron it on. It is also machine washable or dry cleanable. Follow the direction on the packaging for your trans web you are using. When using Steam-A-Seam2, the webbing is protected by paper on both sides. So trace the letters on backwards on one side of the trans web. 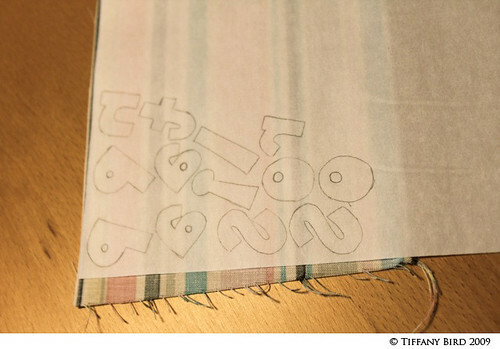 Peel off the paper on the other side and stick it to the fabric. For most trans webs, you iron the webbing side to the scrap fabric then trace the letters backwards on the paper side of the trans web. 3. Cut out the letters. To get the little holes in the middle of the letters (P, O, A), I folded the letters in the middle of the little hole and used a pair of sharp fabric scissors. You could also use an extremely sharp Exacto knife and a cutting board. 4. Measure and pin the onesie to mark center and straight, or just eye it if you’re that good. 5. Iron the letters onto the onesie. Check the trans web packaging for iron setting and duration of ironing. Some trans webs require a cloth or damp cloth over the fabric when ironing. But also check the type of fabric you are using for the correct iron setting. If you are using Steam-A-Seam2, make sure you peel off the second layer of paper before ironing. 6. Stitch the letters onto the onesie using the zig zag stitch on the sewing machine. Or in this case, I hand stitched because the letters are so small. I used running stitch because I wanted the edge to fray a bit. The onesie is a crack up. I love the idea of using grown-up sayings on them. Tiffany, I came searching for this one because I have a question – how did you do this so all the tiny letters won’t rip off the onesie? I hand-sewed some circles on a onesie (to make a caterpillar) and they were all ripped off minutes after my kid wearing it.